One common phrase used by survivors when describing their journey of recovery is that it is an “emotional roller coaster”. When you think about it is quite understandable, pre-SCA a typical survivor might be a seemingly fit and healthy person with no insight or warning or what they are about to go through. The actual cardiac arrest event strikes unexpectedly and suddenly and is an incredibly traumatic event. In a frightenly short space of time a person is thrust from normality to the edge of the abyss, then experiences the physicalities of CPR, AED shocks, intubation, powerful drugs and then is plunged into a deep chilly sleep for a number of days. Of course. in all likelihood most of this is necessary for that person to survive an SCA, but possibly it will also leave some sort of mark. It’s not uncommon for survivors to have no memory of their event, but maybe it’s possible that the shock and horror of all what has happened has been thrust into a box and dispatched to the deep dark receses of the subsconscious? This would be on top of the dazed confusion of what is the re-entry into the world post SCA. The brain needs a constant supply of oxygen to survive and function. Any interruption in this supply leads to a condition called hypoxia, which can cause brain injury. A complete interruption of the supply of oxygen to the brain is referred to as cerebral anoxia, but in practice, these two terms tend to be used interchangeably. Typically a sudden cardiac arrest will result in the victim being in a hypoxic state for at least a few minutes which is enough time for brain injury to occur, but the level of this will be determined by many factors. Hypoxic brain injuries are often overlooked in cardiac arrest survivors due to the fact that the primary illness was unrelated to the brain and is especially true if the impact on the brain was relatively mild. A wide range of difficulties can occur in the survivor, both short and long term, although not all are necessarily seen in every individual. More on brain injuries can be found here and in the Headway factsheet. Disinhibition – loss of control over behaviour, resulting in socially inappropriate behaviour. Apathy/Loss of initiative – become passive, unresponsive and lacking in initiative such that they are totally unconcerned about their difficulties. Personality changes – the person may change in dramatic or subtle ways such that their previous character slips away. Losing a sense of ones own identity can be traumatic and frightening in it’s own right. Mood swings or emotional liability – rapidly changing moods, e.g. going from happy and joking on minute to tearful the next. Emotional states may also be extreme or inappropriate. Post traumatic stress disorder (PTSD) – severe psychological reaction to a traumatic event. It involves the persistent re-experiencing of the trauma, avoidance of stimuli which remind the person of the event, increased arousal, and a numbing of emotional responses. Loss of memory around the time of the SCA means many survivors are not troubled by this but some have disturbing memories from the early stages of their recovery. It should also be noted that PTSD may affect others present at the time of the SCA. Although survivors of Sudden Cardiac Arrest have defeated death, many report going through such a roller coaster of emotions that it’s possible that they go through some form of grief for their previous life. 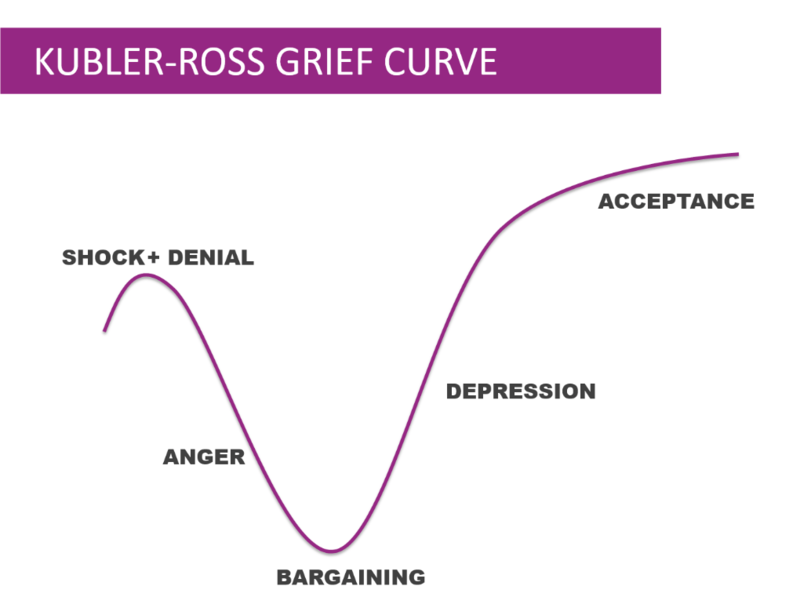 A popular model used to help people understand their grief is called “The 5 Stages of Grief”. This was developed in 1969 by Elisabeth Kubler-Ross as she interviewed people living with terminal diagnoses for her book On Death and Dying. The five stages are denial, anger, bargaining, depression, acceptance but not everyone will experience all of the stages and the order can be variable. Whilst the stages weren’t created for survivors of a sudden cardiac arrest they may be appropriate, especially if the descriptions are interpreted such that they reflect the fact the person has survived death rather than is waiting to die. Some perspectives on coping with grief can be found in this article on Headway. Helpful video from US brain injury organisation Brain Line about the process of dealing with loss and grief after a brain injury. If you are struggling with coming to terms of your sudden cardiac arrest or feel you have an undiagnosed brain injury you should contact you GP to see if you can be referred to a specialist. If you are a member of our Facebook group you may also qualify for free counselling sessions.